When you think of Times Square in New York City, you think of the massive video screens and constant scroll of digital information that give Manhattan’s central district a feeling of vibrant movement, an almost living neighborhood. While it will be on a much smaller scale, a new pedestrian plaza at the corner of Forbes Avenue and South Bouquet Street unveiled Monday night captures some of that excitement and vibrancy right in the heart of Oakland. The Forbes Digital Plaza is the first in a series of projects planned as part of Innovation Oakland. When finished, the plaza will be the centerpiece in a plan to turn the neighborhood that houses so many of Pittsburgh’s universities and hospitals—its so-called eds and meds—into a digital district, with real-time information, music, digital art, and eventually touch-screen information kiosks around the neighborhood. The Forbes Digital Plaza is where Forbes meets Bouquet in Oakland. Courtesy LUXE Creative. The plaza will showcase digital art and community events on massive LED screens, and serve as a central hub in Oakland where people can connect both in person, and via the internet with the plaza’s free Wi-Fi. Georgia Petropoulos, executive director of the Oakland Business Improvement District, said it was modeled after similar parks in other cities, such as Chicago’s Millennium Park. 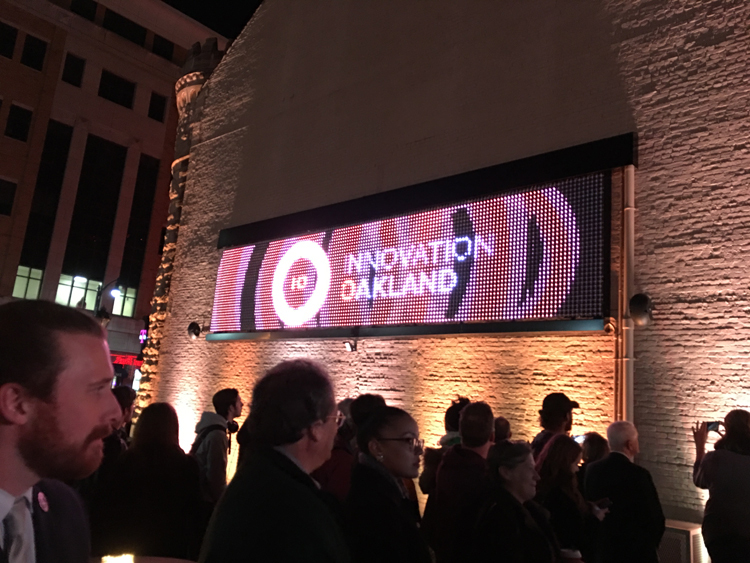 The digital canvasses on the plaza will display real-time information, promote events in Oakland, and house live video streaming. That’s also where the digital artwork will be displayed. Murray Horne, curator of the Wood Street Galleries, will curate the works on the plaza. The first artist in the space is Montreal-based Matthew Biederman who debuted a new work titled Event Horizon. A massive, multimedia display of lights and music, Event Horizon is meant to integrate into the bustle of the neighborhood, and bring the plaza to life. 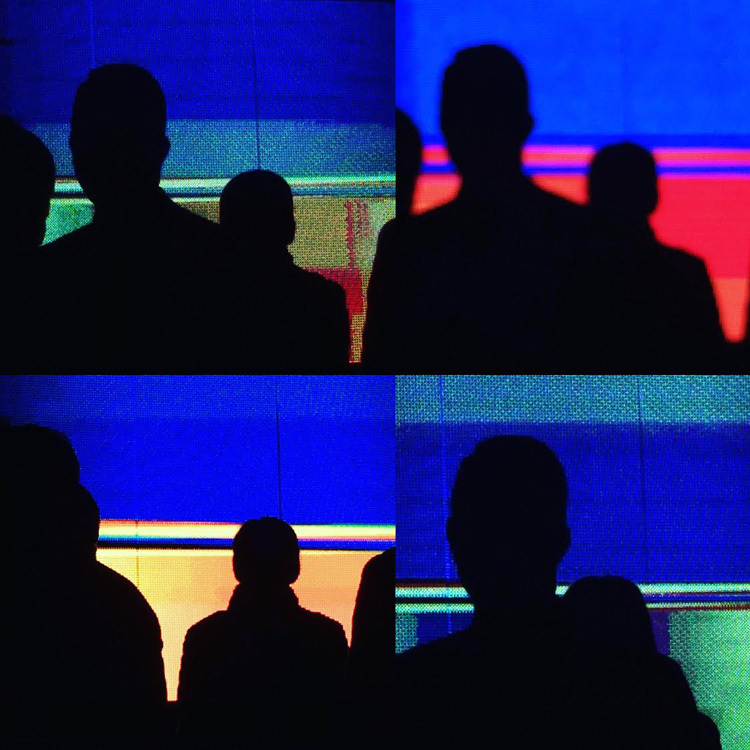 Event Horizon is a multimedia display by artist Matthew Biederman. Courtesy LUXE Creative. The space was designed by Arup architects of New York City, and Pittsburgh-based architects GBBN, Schneider Engineering, and LUXE Creative. “This is truly a community project, and we couldn’t have done it without all of you,” Petropoulos told the gathering Monday night. The unveiling included representatives from the universities, the public sector and the business community, as well as students and residents of the neighborhood. 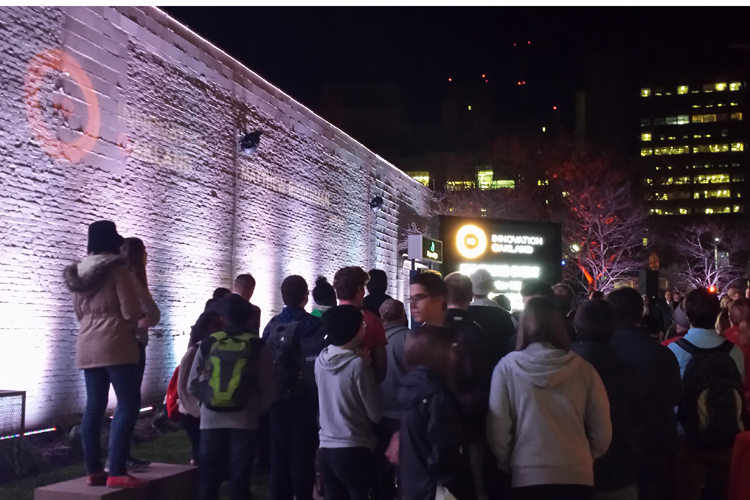 The Forbes Digital Plaza attracted a crowd on opening night. The University of Pittsburgh donated the land for the project, and funding came from a variety of sources, Petropoulos says. 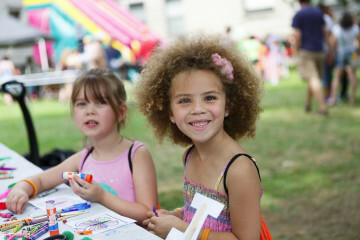 That included Duquesne Light, a grant from the state’s multimodal transportation fund, University of Pittsburgh, Carnegie Mellon University, and the Richard King Mellon Foundation which provided the seed funding. The Heinz Endowments provided the funding that will allow a variety of artists to display their work in the space, on the massive state-of-the-art digital canvasses. 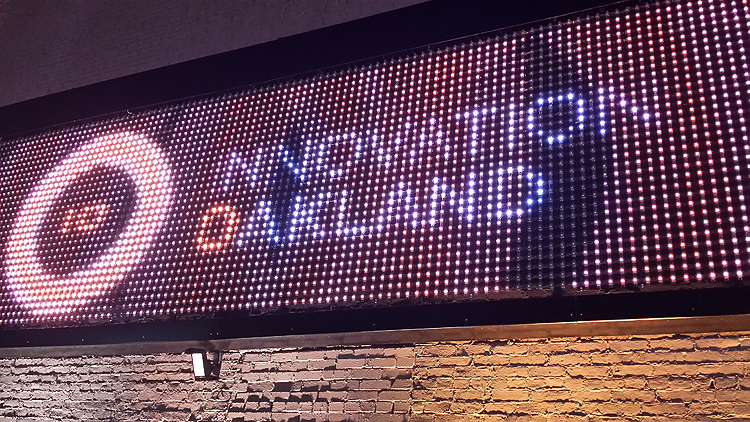 Petropoulos says OBID is working to recruit local artists for future exhibits, and that work has already begun on the next phases of the Innovation Oakland project, which include static signs for pedestrians and drivers, as well as touch-screen kiosks. According to OBID, Oakland is Pennsylvania’s third largest area of economic activity, attracting more than 100,000 students, employees and visitors daily and more than 2 million tourists every year.